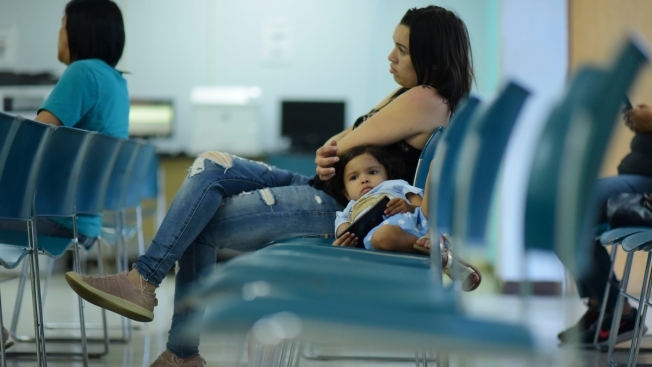 Three-year-old Ailianie Hernandez waits with her mother Julianna Ageljo to apply for the nutritional assistance program at the Department of Family Affairs, in Bayamon, Puerto Rico, Friday, March 29, 2019. Iraida Vargas can no longer afford the two kinds of insulin her aging mother needs and has stopped buying fresh fruit and vegetables as billions of dollars in federal funds that help Puerto Ricans buy food, get medical treatment and recover from Hurricane Maria dwindle despite pleas from the U.S. territory that Congress take action. Vargas and her family are among the hundreds of thousands of Puerto Ricans feeling the sting of what the territorial government says are insufficient federal funds to help the island recover from the Category 4 storm amid a 12-year recession. Her 83-year-old mother is enrolled in a supplementary nutritional assistance program that saw a one-time infusion of $1.27 billion that Congress approved after the Category 4 storm hit in 2017, but the money has since run out, forcing Puerto Rico's government to start cutting benefits this month. "Elderly people here are not living with dignity," Vargas said, noting that her mother has had to stop taking one of the two insulin products she needs to control her diabetes because there is no money to pay for it. She's also on a minimum payment plan with the island's utilities so they don't cut her electricity and water, and can only afford an emergency phone that connects to 911 and does not accept incoming calls. The additional food stamp funds allowed Puerto Rico's government to help an additional 279,000 people previously not covered by a program that serves 1.3 million people on the island of 3.2 million, as well as increase the benefits of those already enrolled. Gov. Ricardo Rossello has asked Congress to approve another $600 million for the program, but it is unclear whether that will happen. The House approved a bill authorizing that amount and it is now before the Senate, which could approve it as early as next week, although Democrats also want money for Medicaid and more generous terms for receiving disaster aid. U.S. President Donald Trump recently said that he supports the $600 million to cover Puerto Rico's food stamp shortfall after initially calling the aid "excessive and unnecessary," but he opposes more generous terms involving disaster aid funds, according to Sen. Marco Rubio of Florida. "Puerto Rico is still struggling to recover," Schumer said. "What the president is doing is unacceptable, and un-American. I urge my Republican colleagues to ... help us pass a disaster package that addresses the needs, not of some, but of all disaster survivors." "When that money arrived, it came with the glory of God," she recalled, adding that her benefits doubled from $200 to more than $400. She said she was able to buy fresh fruit and vegetables, something she hasn't been able to afford since the benefits were reduced. The request for additional food stamp funding comes as Rossello's administration is also seeking a higher Medicare Advantage reimbursement rate for island residents, noting it is more than 40 percent below the U.S. national average. Overall, more than 580,000 people in Puerto Rico rely on the program and more than 40 percent of them live below the poverty line, Rossello said. "How are we elderly people supposed to live?" she asked, adding that she worries about the state of the island's health care system, which has been hit by an exodus of doctors and has led to almost yearlong waits for certain specialists. "What they're doing is an injustice."